Cigarette smoke was part of the background of everyday life in the sixties. Most men and women lit up and children as young as ten took up smoking for the first time. Although most people had a vague awareness of the health risk, only a minority gave up smoking. The first health warning came in 1950 when Professor Sir Richard Doll's research linked cancer with smoking. However, his report was for the medical establishment and it took Doll another four years to convince the doctors. Reports that smoking might be less than healthy started to appear in the press in fifties and people knew about the 'cancer scare'. The Royal College of Physician's Report 'Smoking and Health' in 1962 was a sell out. But after the fuss died down, it failed to change many people's minds on the issue. Government health campaigns were even less effective. Health concerns did, however, influence smokers. From the late fifties many people switched to filter cigarettes. Although people thought filter cigarettes were healthier, there was little evidence that they were any safer than plain cigarettes. For many, economic considerations played a part. The Government increased tobacco duty significantly to reduce the popularity of smoking and filter cigarettes used less tobacco. The space taken by the filter was not taxed, so filter brands were significantly cheaper. The other big change in smoking habits was an old idea re-introduced. The tobacco industry was dominated by the giant Imperial Tobacco (Wills and Player's). In an attempt to gain market share, smaller rival Wix introduced cigarette coupons with their Kensitas brand in 1956. Coupons were given away with the cigarettes and could be exchanged from free gifts, similar to the Green Shield Stamps scheme. Coupons were not new. The tobacco companies had used them in the 20s and 30s, but a coupon war saw such expensive gifts given away that some in the industry thought they were selling gifts rather than cigarettes. A mutual agreement not to trade coupons expired in 1956 allowing Wix to revive them. By the early sixties Wills' market leading Woodbine cigarettes, the working man's favourite and one of the first mass market cigarette brands, was losing market share. It was seen as an old man's product and as a plain cigarette, although in the smallest size (Class 'A'), it was relatively expensive. Kensitas 'Modern Tip' range were bigger, looked classier and gave away coupons. Wills tried and failed with two new brands, Bristol and Strand. Strand famously flopped with the lonely man campaign. The theme tune from the ad was a hit record, but no one wanted a product for loners. Wills succeeded with their next attempt, Embassy. Embassy was launched in 1962. It was marketed with coupons and was a larger Class 'B' cigarette available as plain or filter. Class 'B' cigarettes were seen as a mid market, more middle class product. 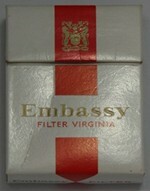 The Embassy Filter brand took the market by storm. It quickly became Britain's number one cigarette. Part of the skill of the marketing campaign was to appeal to men and women equally. Cigarette sales to men peaked just after the War, but women were catching up with men in the 50s and 60s. Paradoxically as some men quit, many women saw smoking as liberating. Embassy smokers were younger people, often enjoying a night out. The traditional working man smoking his Woodbines and drinking mild was ousted by younger men drinking Watneys Red Barrel and smoking Embassy. Player's, Wills in-house rival, also saw their traditional best selling brand Player's Medium lose ground. Player's Medium with its famous 'hero' sailor on the pack was a top seller in the 30s and 40s. It also lost out in the changes that were taking place in the 50s. It too was a plain, rather than a filter brand, but targeted the middle class, rather than working class market and appealed to women and well as men. 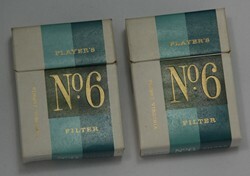 Player's new brand for the 60s, Player's No 6, was launched in 1965. Number 6 meant nothing, it was dreamed up by the marketing men at Imperial. It was a smaller, Class 'A' brand, like Woodbine, but was predominately a filter brand. It was targeted equally at women as well as men. Player's No 6, challenged Embassy for the number one spot in the latter years of the 60s. Player's No 6 had a strong following with female smokers, particularly those with working class occupations. In the 1971 film, Get Carter, Jack Carter's niece, Doreen, who worked in Woolworths, smoked Player's No 6. With Imperial brands dominating the cheap and mid-priced sectors, there was more room to compete at the top of the market. Changes in smoking taste happened quickest with more affluent smokers and by the late fifties there was a small, but growing market for King Size filter cigarettes. 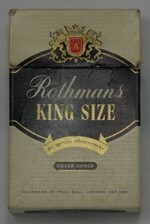 Carreras, the third largest cigarette manufacturer, launched Rothmans King Size in 1957. It quickly became a market leader and they confidently advertised it as 'the best tobacco money can buy'. Gallaher, Britain's second largest cigarette manufacturer, was also squeezed in the mid market by Imperial. Instead they took on Carreras' Rothmans King Size with new brand, Benson and Hedges Special Filter, in 1962. Like Wills' Embassy it was a superb piece of marketing and packaging. The innovative new gold pack, which bore the Royal Warrant, suggested that the contents were of value. 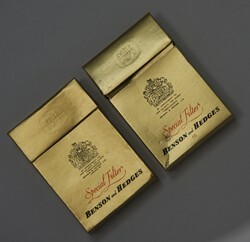 Benson and Hedges 'Pure Gold' campaign began in the sixties, with a slightly tongue in cheek take on the value of gold. 'What does the best man always remember? ', 'What do you keep in reserve for special occasions?' Answer: Pure Gold from Benson and Hedges. These two brands competed head to head, but B&H Special Filter had the edge and it overtook Rothmans King Size in sales by 1965. However, Rothman's was still seen as the number one middle class brand in the 60s. Benson and Hedges was more aspirational. Silk Cut, launched in 1964, showed a remarkable anticipation of future trends. Silk Cut was one of the first mild cigarettes. The original 1960s' version was not particularly mild by later standards, but had significantly lower tar and nicotine ratings to rivals. It was not a huge seller, but established a reputation as a modern middle class brand. Although there is strong evidence to suggest mild cigarettes offer no health benefits over stronger ones, mild cigarettes took off in the 70s and 80s as people became more concerned about smoking and health. Although there was a slow drip feed of bad news about tobacco smoking, it failed to sink in for many people. A rash of new brands and some clever marketing helped keep the tobacco industry earning healthy profits. In the early 70s there was much more of a collective waking up to the dangers of smoking. In 1966, at age 23 I was with Canada's Department of External Affairs on my first posting, to our Permanent Mission to the United Nations in New York City. I was able to buy cigarettes duty free at 6 cents a package of 20 and liquor for $2.00 a 40 oz! So my smoking, which began with the odd cigarette at age 12 to a pack a day increased considerably. After I was in New York for about two months a radio announcer indicated that New York was entering the second year of a drought [it eventually lasted nearly four years before regular rainfalls returned] and if one was living and working in the city [which I was], breathing the air was like smoking two packs of cigarettes a day. Well I noticed I was coughing a lot and since I was smoking 2-3 pack a day I thought I had better cut down. I began by only smoking at parties. I did not cut down much since there were parties virtually every evening. In a time when smoking was permitted in the office and almost everywhere I decided I had to stop completely. I had my last cigarette on New Years eve 1966. It was the best decision I ever made! I have watched good friends who could not quit, die a slow painful death because of smoking. However, I am proud that I was instrumental with encouraging about 50 people to stop and this was in the days before the dangers to health were so well publicized. I cannot understand why anyone would smoke today. "hi i have a players no6 cigarette cut out air balloon advertisement made from what looks like good tuff cardboard, looks 3d when standing looking at it,iv looked everywhere to try find one close to it but cant anywhere,and was just wondering if it would be worth anything and is it worth keeping? "I have a carton of Belvedere-extra mild sealed it does have warning on it, 200 tobacco sticks. Also du Maurier a carton of 8/25-200. Also Players light cigarette tobacco 200 grams to roll your own.No warning. Could you please tell me if they are worth anything? "I have a large amount of Benson & Hedges cigarette coupons. Are they of any value, can they be redeemed?